It's Frugal Decor Tuesday and while today's post is frugal, it is not a thrift store treasure makeover. I'm going to have loads of those to share over the next several weeks because at the moment, I'm in a frenzy getting littles ready to sell at an outdoor market on the 23rd. 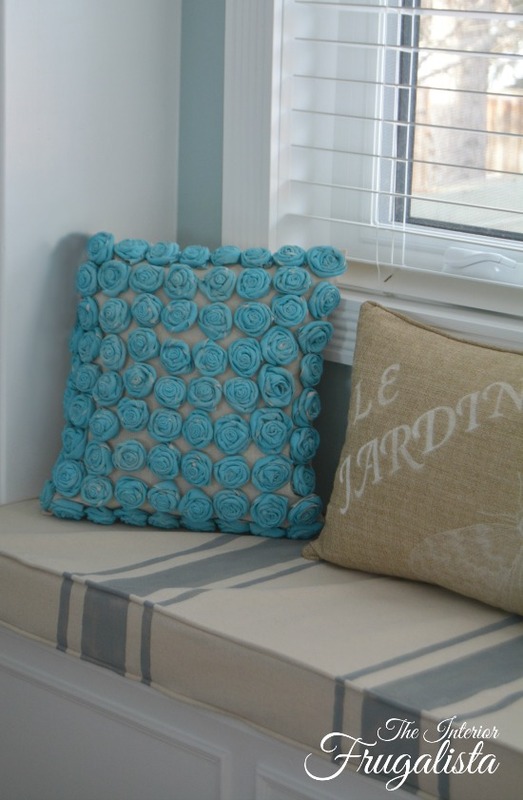 When I posted our Bedroom Window Seat REmakeover in March, several readers asked about the Turquoise Rosette Pillow, so I thought I'd share how I made it with you today. It is made with an inexpensive canvas drop cloth. The first step is sewing an envelope pillow cover and I shared a step-by-step tutorial on how to make one here Vintage Pearl Earring Pillow. 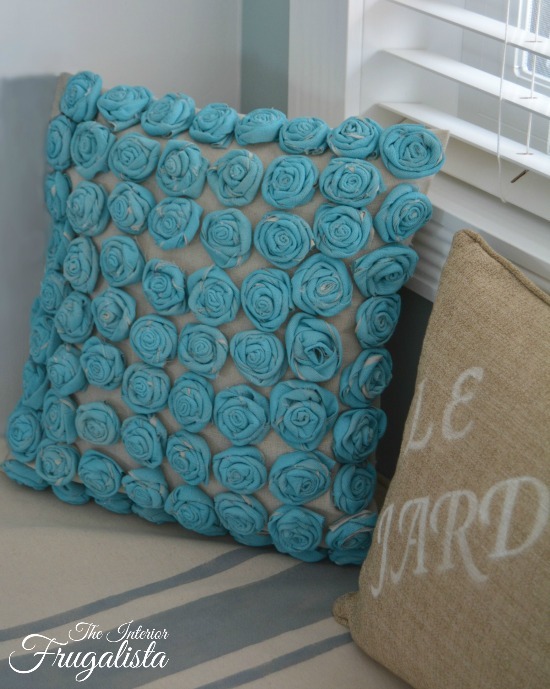 If sewing isn't your thing, you could purchase a neutral color pillow cover for this purpose. * A portion of this project was sponsored and I was compensated or given a product to complete it. I only share what I feel is useful to my readers and 100% of the commentary and opinions are that of my own. I've also included affiliate links below so you can see the products or similar products that I used to complete this project. Now onto the fun part, adding a pocket full of posies onto the front of the pillow cover with DIY Rosettes. I'm not going to lie, this step is time-consuming so I suggest you make these while binge watching Netflix. You will need a piece of fabric 18" high x 12-feet long. I used leftover pieces of the canvas drop cloth. Note: Skip this step if you are using colored and/or patterned fabric. Using a foam roller I painted my canvas with Americana Multi-Surface Paint in the color Turquoise Waters. The paint moved easier when I lightly sprayed the fabric with water first. You will notice in the picture above that I cut the strips of fabric first before painting them. Don't do that - it's much easier if you paint the fabric first. It may take more than one coat to get the coverage you like. Once dry, the next step is cutting the fabric into strips. 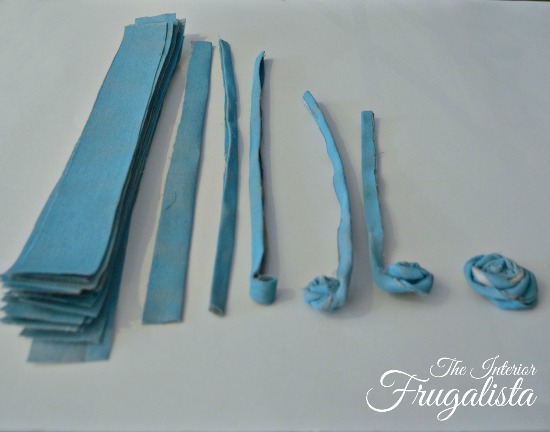 Cut the fabric into 2-inch strips using a straight edge and a rotary cutter. I strongly urge you to have a small bowl of water nearby for those nasty hot glue gun burns. 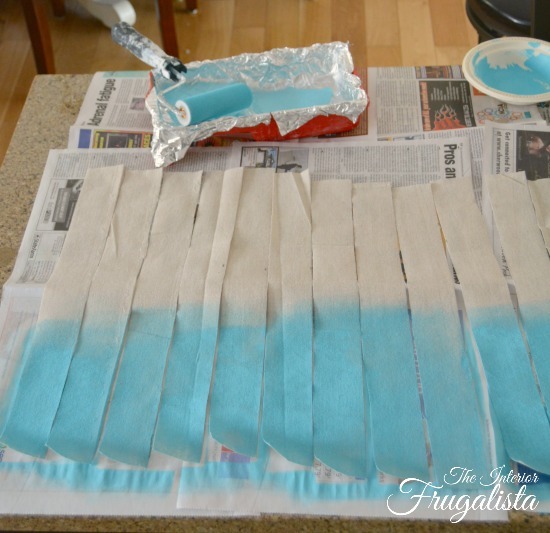 Fold the strips in half lengthwise and in half again. Add a dab of hot glue every so often to hold them in place. Roll the strip tightly about 1/2-inch thick and dab hot glue to hold in place. Twist the strip a couple of times and add a dab of glue to hold in place. Continue twisting and wrapping the strip in a coil-like fashion, dabbing hot glue to hold in place. This part takes a bit of practice. Attach a small strand at the end with hot glue on the bottom side of the rosette. Repeat Steps 1-5 until you have made enough roses to cover the front of your pillow. Mine took 75 rosettes...yup, I said 75 to cover a 16-inch pillow form. Find the center point of the front of your pillow cover and mark it with a pencil. Attach a rosette with a few days of hot glue. Work your way up and down from the center rosette to create your first vertical row. You may end up with a small gap at the top and bottom and that's just fine. Repeat this step to the left of the first row and then to the right until the entire pillow front has been covered with rosettes. Again, you may end up with a small gap on the sides and that's just fine. Insert your pillow form into the cover and you're done! 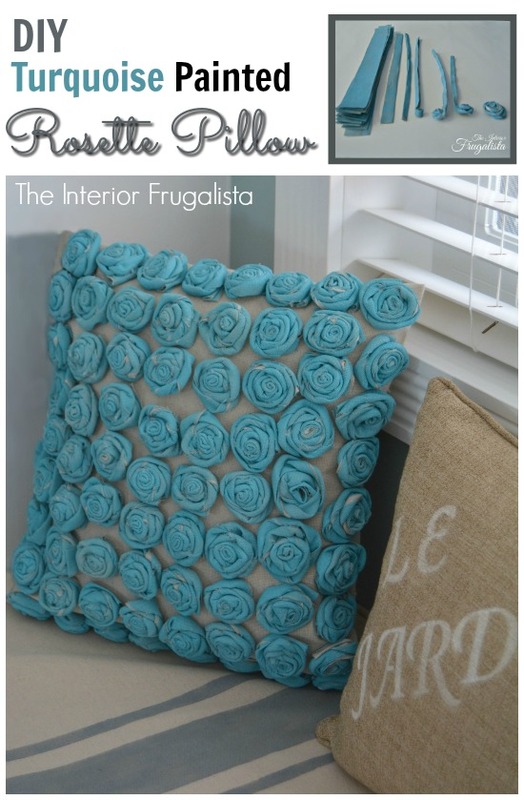 If you found my rosette pillow tutorial helpful, please share it with a friend and/or save it on Pinterest. I hope those of you who wanted to know more about my pillow found this tutorial helpful. Would you have the patience to make one of these pillows? Notice I only have one on my window seat! Before I end this post, have you been following the Between The Lines series every Tuesday? It is a series that began on April 19th and I was one of the lucky bloggers to be featured in the first edition. If you missed it, you can catch that post HERE. You can catch Week Three of the series HERE. For those of us "seasoned" bloggers, it's a great way to meet other bloggers in the Nifty Fifty Club!